A flooded area in Carolina, Puerto Rico, after Hurricane Maria swept over the island. Public broadcasters plan to send equipment and engineers to hurricane-ravaged Puerto Rico this week as they work with broadcasters on the island to get stations back on the air. Meanwhile, nonprofits and foundations are organizing to combat government corruption amid the disaster. CoastAlaska, a nonprofit collaborative among public media stations in southeast Alaska, is donating a kit to help WIPR-FM in San Juan restore its signal. And the National Association of Hispanic Journalists, with financial support from the Knight Foundation, is leading a broader effort to send communications equipment to broadcasters, including community radio station Radio Vieques and nonprofit investigative outlet and Knight grantee Centro de Periodismo Investigativo. 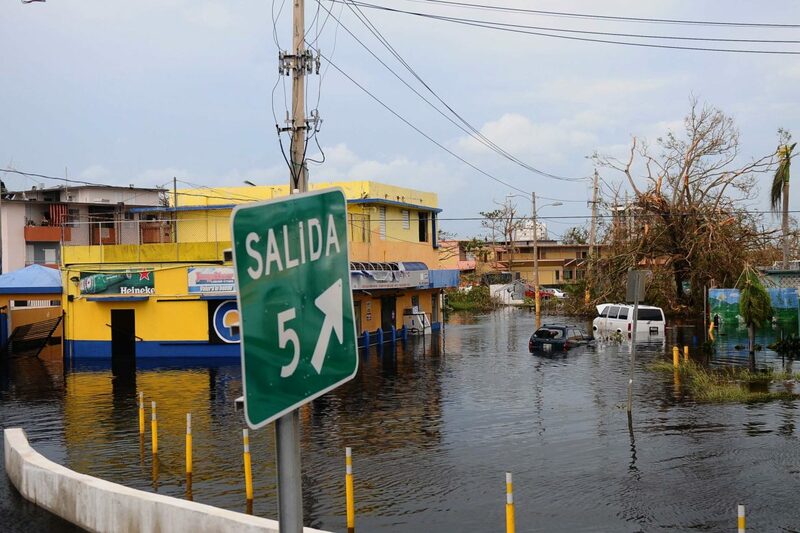 Working with other Knight nonprofit media grantees, NAHJ is also working to aid journalism that focuses on the island’s recovery and holds government officials accountable. 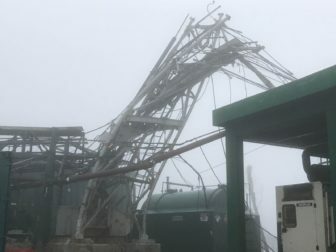 WIPR’s main broadcasting tower in Cayey, Puerto Rico, collapsed during Hurricane Maria and struck a nearby building housing transmitters for its television and FM signals. Broadcasters in Puerto Rico were sidelined after back-to-back hurricanes two weeks apart in September. Stations struggled to get back on the air after Hurricane Maria destroyed broadcasting infrastructure and left the island without electricity Sept. 20, according to the Latino Public Radio Consortium, which has been tracking the condition of stations in Puerto Rico. Maria also devastated Puerto Rico’s communications networks. CPB provided $120,000 in funding to Puerto Rico stations after Hurricane Irma passed the island Sept. 6 but has not provided additional funding to stations after Hurricane Maria. It is paying for engineers to travel to the island this week to activate broadcast equipment. The lack of infrastructure and poor communications have hindered broadcasters’ in helping Puerto Rico, organizers of the efforts say. Fundraising efforts have been slow to come together, which some attribute to donors prioritizing basic needs such as food, housing and water before communications. NPR, CPB and LPRC have been coordinating to get WIPR-FM back on the air after it suffered transmitter and satellite dish damage during Maria. WIPR-AM came back on the air after Maria and has been able to broadcast public radio content, according to Michael Beach, NPR v.p. of distribution. Just getting in touch with people in Puerto Rico has complicated assessing damages and planning a response, said Beach and others. Most of the island is still without power, and many roads are blocked or unsafe to travel. WIPR has been challenged in keeping its generator at its station in San Juan running on diesel fuel when filling stations are being patrolled by police, people are limited in how much they can collect and government use is a priority, said Beach and Magaly Rivera, executive director of LPRC. Without electricity, WIPR is spending almost $5,000 a week on diesel fuel. Rivera is fundraising for a vehicle to collect and transport the fuel. Meanwhile, CoastAlaska is donating a “radio to-go kit” to WIPR, said Mollie Kabler, executive director of CoastAlaska and Alaska Public Broadcasting Inc. Designed by CoastAlaska, the kit contains basic studio and transmitter equipment that will enable radio broadcasts powered by as little as a car battery. The equipment’s use in Puerto Rico will be its first deployment in an emergency situation, Kabler said. It was tested last month at an expo in Juneau. CoastAlaska developed the equipment following a devastating tsunami in southeast Asia in 2004 because its members are potentially vulnerable coastal stations. The 250-pound kit was shipped Monday from Juneau to New York City. CPB is paying for two engineers from WNYC to accompany the equipment to Puerto Rico Thursday and help activate the kit, according to a WNYC spokesperson. Following Hurricane Maria, LPRC launched a GoFundMe campaign with a $100,000 goal to support five of its member stations in Puerto Rico. Nearly three weeks later, it’s raised $2,985 from 63 donors. Rivera attributed the low sum to the majority of mainland Puerto Ricans giving directly to their families and to large, nationally recognized relief organizations. “The public and donors are looking at electricity, food and water as the main priority and not realizing the importance and significance of communications,” Rivera said. Although Greater Public has a fund to help support public broadcaster colleagues affected by disasters, it has not yet sent funds to Puerto Rico. With poor conditions on the ground, it has not received any applications, said Andrew Leitch, director of marketing and member station relations. Mc Nelly Torres, a Puerto Rican investigative journalist, is concerned about corruption in the territory’s government. Many groups are raising funds for the disaster, and she wants to help colleagues on the island follow the money. Torres, co-founder of the Florida Center for Investigative Reporting, is among the NAHJ members who will deliver communications equipment to the island in coming weeks. NAHJ is raising funds to send equipment to partners including Centro de Periodismo Investigativo, a nonprofit investigative news organization, and Radio Vieques, a community radio station and LPRC member, Torres said. The equipment may include a satellite phone, solar-power chargers, Iridium units that create Wi-Fi hot spots, and GoTenna devices to create a mesh network that connects to phones, according to NAHJ. Carla Minet, executive director of the investigative center in Puerto Rico, lives inland in Caguas. Since Maria, Minet has been driving around looking for Wi-Fi so she can park and work in her car for a couple of hours, said Torres, who taught Minet data journalism. The investigative center has been filing stories since the disaster. Last week, NAHJ announced the launch of the Puerto Rico Emergency Communications Access and Journalist Initiative, a crowdfunding campaign and task force to increase communications access for journalists in Puerto Rico and to help produce and promote stories about recovery efforts. The campaign aims to raise $10,000, and the Knight Foundation will match the first $10,000 raised for the campaign. Equipment will also be used to send information to NAHJ, which will help with family unification efforts underway among U.S. media. At the Online News Association conference in Washington, D.C. last week, digital journalists, LPRC’s Magaly, NAHJ members, Knight Foundation representatives and others met to consider how to send support to Puerto Rico. NAHJ led the conversation, which evolved from addressing basic needs to brainstorming around social-media verification and training for investigative reporting that will be needed long-term. The group is in the initial planning stages of working with First Draft, a nonprofit Knight grantee that offers guidance about finding, verifying and publishing content sourced from social media. First Draft may provide social verification training to journalists on the island. Alaska Public Broadcasting Inc. and CoastAlaska will work together as state funding declines.